Hello, it's Martine here. Welcome to Episode 29 of The Teaching Space Podcast. 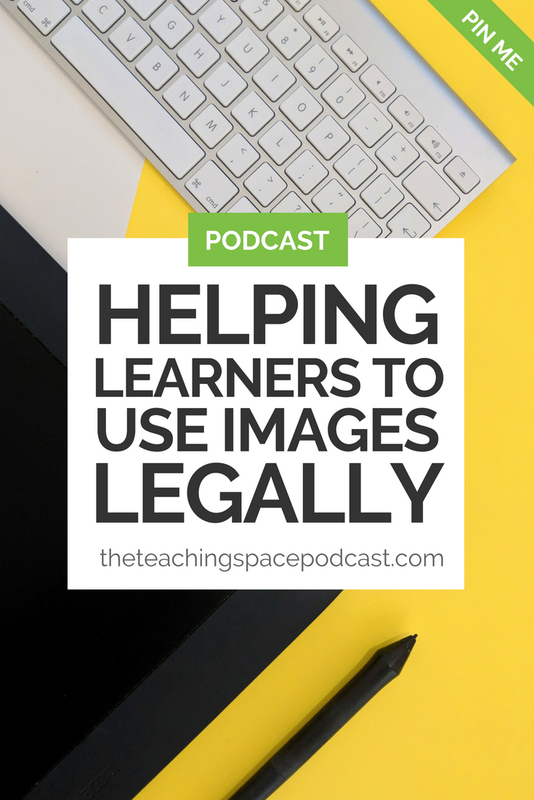 Today we're talking about how to help learners use images online legally. Let's start with the why and then move onto the how. So, why is it important that we help learners use images online legally? Now, more than ever, we are asking our learners to produce content, often as evidence for assessment, and this content could easily be online. For example, things like blogs, presentations, leaflets, posters, that sort of thing. This type of content is usually enhanced by the use of images, so we should definitely be encouraging our learners to use images, but they need to use them correctly, in the same way that we teach our learners not to plagiarize. And with good reason, they need to use images in a legal way. You could argue that your school or college is a closed environment, in other words, things are not likely to get onto the actual real-life internet, but I would counter that argument with the fact that we are trying to prepare our learners for the real world, so let's set them up with good habits and good practices now. How Can We Help Our Learners? How do we go about helping our learners then? The first thing I recommend is that you lead by example. You demonstrate best practice, ensure that your resources, your presentations, your handouts all show images that are attributed correctly. Images that don't have copyright, watermarks on. Lead by example. Next, I would teach learners about image licensing and copyright as soon as is age appropriate. I really recommend getting very familiar with Creative Commons Licensing in particular. If you're looking for photography to use in presentations and other types of resources then this is definitely the way to go. You can read up on Creative Commons licensing on their website, Creativecommons.org/licenses, and then transmit this information to your learners. You could recommend your learners focus on using Creative Commons zero licensed images; this is like the lowest level of licensing and doesn't require users to attribute the work to the producer of the work, the photographer. I think it's great when people are getting started, however, you might want to draw your learners' attention to other licenses, those that require users of images to attribute the work to the owner. The reason I'm saying this is it gets them in a good habit of citing their sources, so if they're going to be moving on to writing lengthy assignments you can then start talking about bibliographies and citations, and things like that, so there's a really nice link. This will be very dependent on the type of learners you work with, but be aware that there is this range of licensing options and there are different requirements. If you get nice and familiar with them you can help your learners cite their sources appropriately. If you're on the lookout for some good free photography resources for teachers and trainers I've written a blog post on this very topic. The websites that I share are mostly Creative Commons zero licensed images, but always check before you use any of the images from these websites. You want to be 100% sure. You might want to get into the habit of attributing the image to the photographer anyway, even if it's not a requirement. This is you leading by example, demonstration best practice to your learners. Encourage Your Learners To Produce Their Own! While I do think it's really important to spend some time explaining copyright and image licensing to your learners, there is another option, and that is for you to empower your learners to make their own images, diagrams, illustrations, whatever it is they need for the piece of work they're producing. I'm going to share some ideas with you on this topic now. If your learners need diagrams to illustrate a point they're trying to make, then actually, creating doodles can be really effective, and it can get your learners to explore their creativity. Particularly if it's in a not obviously creative subject, actually bringing in a bit of doodling, a bit of art can be a very positive thing and might help you engage with learners who aren't otherwise engaged in the subject. Obviously, pen and paper are fantastic. You can, if you need to, scan them. Tidy them up using various editing tools, and then pop them into whatever it is the learner's creating, a presentation, or a handout, or whatever. Learners can also produce diagrams and doodles electronically; you can use tools like Google Drawing, Adobe Spark, or Canva. Don't forget the humble digital camera, or in this day and age I guess it's your mobile device. This is dependent on the age of your learners of course. Encourage your learners to use their mobile devices to take photographs so that they can illustrate the work they are doing with their own photos. You might even get them to credit the photographs to themselves as they are indeed the photographer. Another important skill to teach your learners in terms of using images legally is to get them using Google Image search in the correct way. I've got a nice short video on my YouTube channel, which shows you how to do this. This is a video you can share with your learners and get them to look at independently. So, as well as focusing on the Creative Commons licensing stuff, using Google Image search is a great way to find pictures that could be used in student work. My final suggestion is that you could consider buying images, but I don't know many schools and colleges that have enough budget available for this. If it is something you want to look into then I recommend Depositphotos.com. Buying photos isn't cheap. However if you're interested in Deposit Photos I have a top tip for you. Join the email list for a website called APPSUMO.com, that's A.P.P.S.U.M.O., as they often have really interesting deals on things like stock photography. I've picked up 100 credits for Depositphotos for a super cheap price on APPSUMO, so it's worth keeping an eye out. Okay, that's it for today's episode. I'd be really interested to hear if helping learners use images legally is something that you've struggled with in the past. Or, is it something that perhaps your colleagues need to get their heads around? If I'm being really honest I have seen quite a few teachers, often senior managers as well, delivering PowerPoint presentations or Google Slide presentations and they have included copyrighted images. I mean, there's a watermark across the entire image, and this is not good, we really can't have this going on. Do let me know what you think. I'd love to hear your experience. You can do this in The Teaching Space Staffroom which is our Facebook group. Please hop over to Facebook and find The Teaching Space Staffroom and ask to join. I would love to chat to you in there. Okay, right, that's it from me today. Thank you so much for listening, and I hope you'll tune in next time.